Hero Comics blank covers: Yes, they exist! 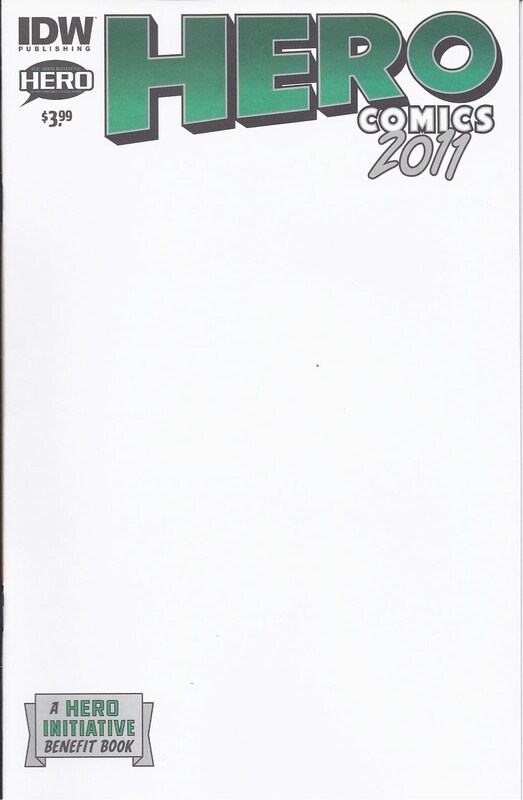 And the next rare bird you'll be seeing: Hero Comics 2011 blank covers. Yes, they exist. But just barely. 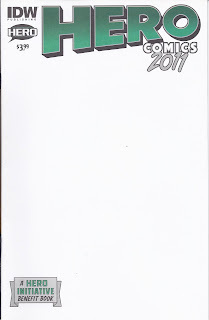 Hero Initiative will likely be spreading them around to a few artistic friends and family to do some drawings on. More on that…when it happens! More great PopCons pics; Dragon*Con Edition! George Pérez! Steve Dillon! Spider-Woman! Fabulous comic babes! Corsets! Starfire! Get thee to Hero Initiative's PopCons.com page to see our latest pics from 2012's Dragon*Con in the ATL! You'll be glad you did! Check out Hero's YouTube page in general, or feel free to hop straight to a new cut of a Hero video, specifically highlighting some of the very specific people with very specific stories whom we've helped. 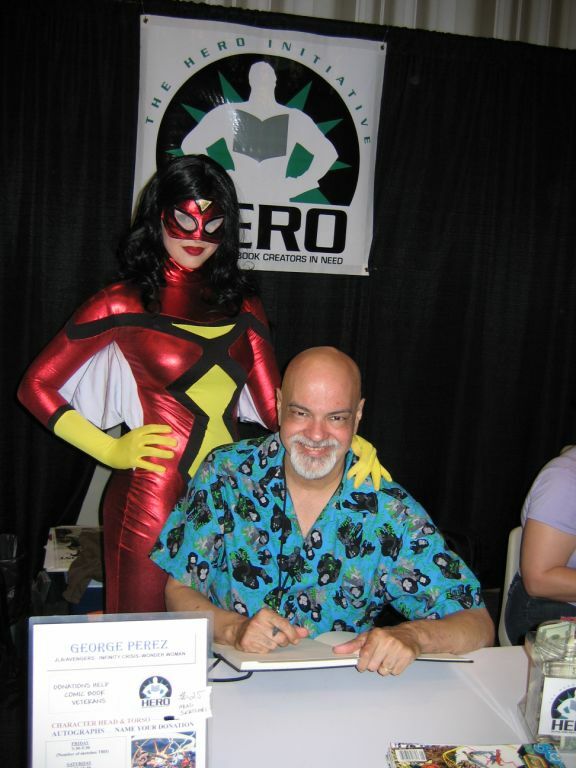 And speaking of which, Hero will be at the New York Comic Con Oct. 13-16. On Friday, Oct. 14 at 11 AM, Hero will have a panel with some OTHER folks we've helped. Full details below. Hope to see you there! 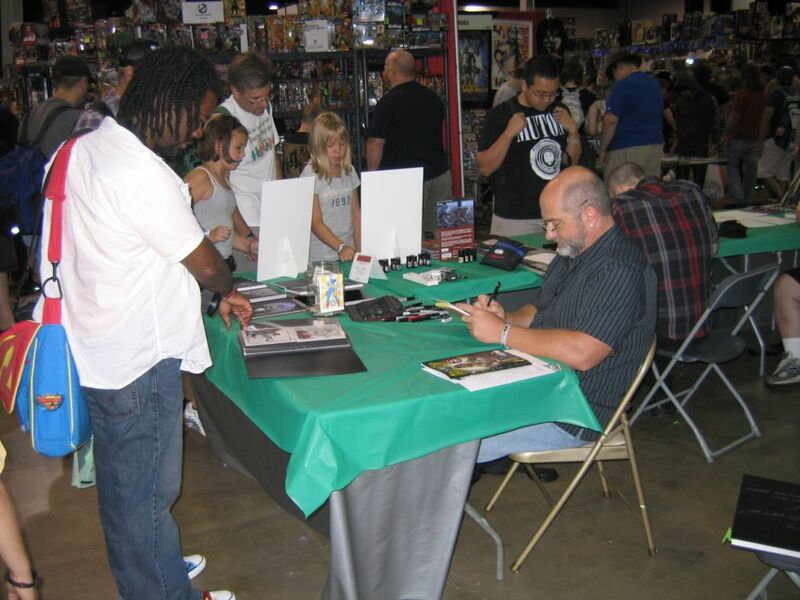 Find out all about the Hero Initiative, the only federally chartered charity dedicated to helping comic creators in medical or financial need. Hero has paid back rent when creators are literally 24 hours from eviction, paid to keep the heat on in the winter, and covered the cost of crucial medication and treatment that frequently meant the difference between life and death. 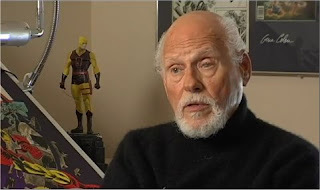 Hero Initiative President Jim McLauchlin is joined by Hero beneficiaries Ralph Reese (House of Secrets), Chris Ivy (Moon Knight), and Robert Washington (Static), who will tell their own personal stories about how Hero has changed THEIR lives…for the better. Convention tickets and Hero bucks! The Long Beach Comic & Horror Con fast approaches! You'd best be making a beeline to the LBC Oct. 29 and 30 to make the scene! But to do that, you'll need Long Beach tickets! And while you're picking those up, we heartily encourage you to donate an additional $5 to Hero at time of purchase. Just click on the Hero Initiative logo as you're making your purchase, and slide us a few bucks. The con folks will send that dough off to Hero! And because rust never sleeps, 2012 creeps just around the corner! There ain't no party like a MegaCon party in the Southeast, and the Orlando MegaCon will be here before you know it, Feb. 17-19, 2012. You can get your MegaCon tickets NOW, and do the same! The fine folks at MegaCon have enabled Hero donations along with your ticket purchase when you check out! A buck, two bucks, five…whatever you got! It's easy, cheap, but when enough people do it, it adds up QUICKLY! There are some people and entities whom, in a behind-the-scenes sense, have been critically important to Hero Initiative's success and ongoing mission. Dave Sim is one of those people. Paradise Comics in Toronto is one of those entities. Steve Gerber. A lawyer name'a Harris Miller. Others. Someday, I may get to those stories. But today, it's Black Phoenix Alchemy Lab's day to bask in some light. Black Phoenix is—my words here, they might choose others—a "boutique perfumery," a joint that does super-cool scents WAY outside the mainstream Chanel no. 5 norm. They've hit big in the comic market, and my gut says they'll only get bigger. They have a great following among the goth girl and anime chick markets. And they're also DAMN fine people to work with. One reason: They love giving something back. 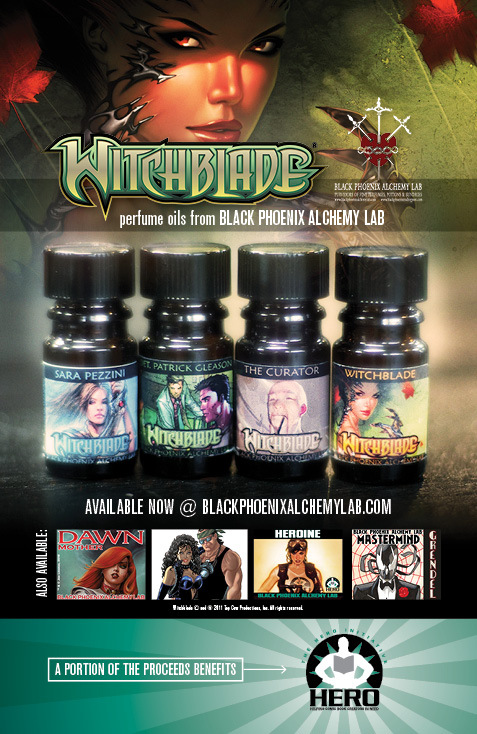 So back in 2009, BPAL approached us about doing some sort of comic-themed scent. As George Pérez is on Hero's Board of Directors, and he and Peter David have all rights to Sachs and Violens, I threw that out as a possibility. They liked it, we planned a launch for Wizard World Chicago, and wheels were in motion. My mind started getting blown mere minutes after the convention doors opened, and people starting herding to our booth, asking for Sachs and Violens. My guess was it would be a modest seller, a novelty at best. But BPAL's own devoted fans were there in full force. We'd say, "Oh, yes, we have it right here, and in fact, hey—here's George Pérez. He's the artist of Sachs and Violens and the co-creator of the property." The answer usually came back, "Yeah, that's nice. Gimme the perfume, please. Here's your $25." Mind-boggling. Pérez is a star of cosmic magnitude on the comic con circuit, but these people were BPAL fans first and foremost! Hell, we had even organized a crazy-cool speed dating party as part of the launch, and sold that event out. I saw firsthand the power of BPAL's devotees. Sachs and Violens was such a hit that we went on to do Witchblade, Dawn, Heroine, and now Grendel. The BPAL folks have been delightful to be around, professional to a fault, and have provided a significant chunk of change for Hero's coffers. There's NO doubt in my mind that some people have a roof over their heads right now or a warm spot in their belly tonight because of the efforts of Black Phoenix Alchemy Lab and their amazing fans. We thank them. And highly recommend you check them out. Hey, they've got an entire Neil Gaiman line as well! More great Hero con pics: Albuquerque, San Diego, Chicago! 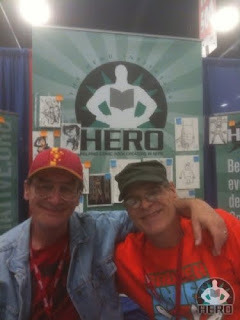 And Bernie Wrightson and James O'Barr at the Albuquerque Comic Expo! 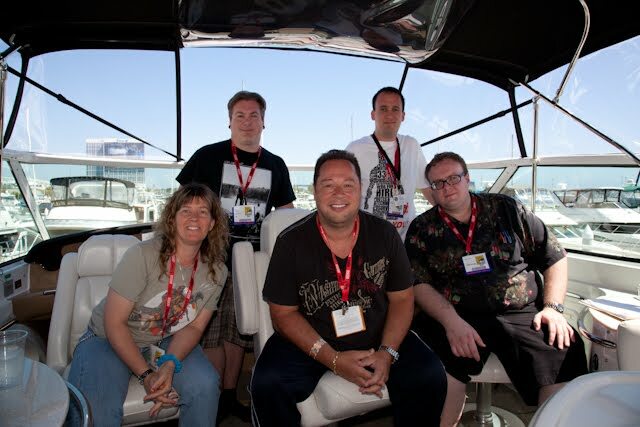 Seriously, PopCons is a great repository for convention pics that YOU can add to as well. Like babes in costumes? Creator sketches? Howard Chaykin's Hubble telescope glasses? They got it ALL! Hot dogs help Hero! Really! It's time for the Labor Day tradition right up there with backyard barbecues and dreading school—the annual re-upping of your Ralphs card for Hero! On September 1, Ralphs wiped the slate clean, and we need to build back from Square One! When you register your Ralphs Rewards card with a Ralphs-approved charity, EVERY time you shop and use the card, Ralphs will kick in a small percentage to the charity of your choice. It costs you, the consumer, NOTHING. It’s just Ralphs kicking in a couple bucks to good causes. 1a) If you have not created an account, create one now! Takes about 60 seconds! 3a) Hit “enroll” at the bottom. 4) Now enroll! When signing up, our NPO # (non-profit organization #) is: 80680, and we're under our corporate name, "A Commitment To Our Roots." Don't let it throw ya! 5) Now go get a pie. That's it! We greatly appreciate your support in the past, and hope we can count on it in the future! Any questions, please let us know!